The former Arby's site is being advertised for sale or lease. StateCollege.com photo. Arby's signage at the property has been removed. StateCollege.com photo. Fast-food fans returning to Penn State for classes this month will find a local staple has disappeared. The Arby's at 400 W. College Ave., in business in downtown State College for at least four decades, closed without fanfare earlier this month. Neither Arby's corporate offices nor Wayne Pagani, listed online as the local Arby's owner, has responded to inquiries from StateCollege.com. 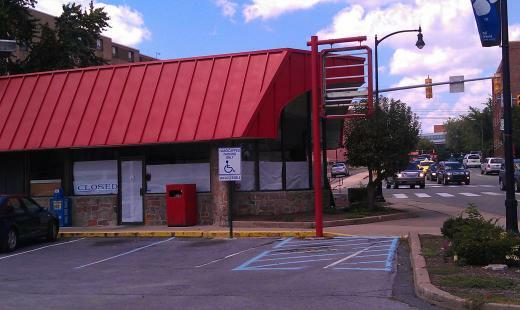 About two weeks ago, StateCollege.com first posted on Facebook a photo showing a suddenly empty-, vacated-looking Arby's building. Since then, Arby's signage has been removed from the structure. 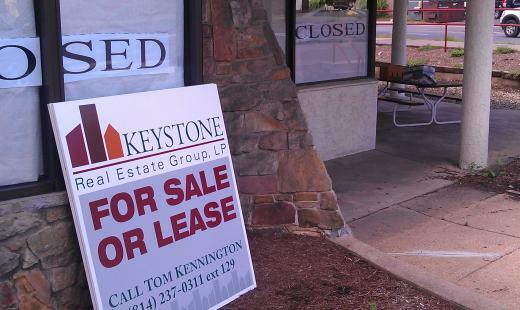 And a Keystone Real Estate sign -- advertising the property for sale or for lease -- has appeared outside. Attempts to reach Keystone for comment have been unsuccessful, as well. "CLOSED" signs are positioned in the building's windows. The Arby's briefly shut its doors after a car wreck -- a suspected DUI incident -- damaged the building in November 2010. It was at least the second car crash at the address, at the West College Avenue-Atherton Street intersection, in the past several years. Aside from those wrecks, though, the property appears to be in a largely favorable location for commercial development. State College borough zoning rules allow a variety of retail, restaurant-driven, residential and other land uses in that area. Student apartments, another restaurant and a motel are in the immediate neighborhood surrounding the former Arby's property. As of late last week, no new plans for the site had been submitted to borough officials.